In his classic book Southern Politics in State and Nation, V.O. Key Jr. wrote about the importance of “friends and neighbors” in one-party southern elections. More than half a century after the book was written, strength at home powered yet another Deep South candidate. Tuesday night featured about as dramatic a race as we’ve seen in recent years, which not only delighted the political hacks on Twitter but, more importantly, produced a result that suggests a victory for the more conservative wing of the Republican Party. Throughout much of Tuesday night’s GOP Senate primary in Mississippi, Sen. Thad Cochran (R) looked like he might not only finish with more votes than his Tea Party challenger, state Sen. Chris McDaniel (R), but also get above the 50% threshold he needed to avoid a runoff. Things were looking good for Cochran’s establishment backers, which includes much of the powerful Barbour clan, helmed by former governor and Republican National Committee Chairman Haley Barbour, as turnout came in much higher than expected and Cochran performed well in the northeastern part of the state, which some believed would be McDaniel country. But then Jones County, McDaniel’s home base in the southeast near Hattiesburg, finished reporting its results. The county’s turnout and McDaniel’s performance were eye-popping. In the 2012 Republican presidential primary, the county cast 8,663 votes; this time, it cast 12,967 — and gave McDaniel 85% of those votes. McDaniel’s friends and neighbors showed up in force. That, combined with a weaker-than-expected performance by Cochran in Rankin — the Jackson-area county that casts the most GOP votes in primaries — allowed McDaniel to grab the lead. As of this writing, McDaniel leads 49.5% to 49.0%, with another candidate, Thomas Carey, grabbing 1.5% and forcing a runoff on June 24. We think McDaniel starts as a favorite in the runoff — the race reminds us of Sen. Ted Cruz’s (R) eventual victory over David Dewhurst in the 2012 Texas GOP Senate runoff, especially because McDaniel would be a Cruz ally in the Senate. Cochran’s weak performance throughout the campaign also brings to mind former Sen. Richard Lugar (R-IN), who lost a primary in 2012 to a Tea Party-oriented candidate, Richard Mourdock. We wonder if McDaniel might have won outright if a story involving one of his supporters photographing Cochran’s bedridden wife in a nursing home hadn’t broken a few weeks ago, although this was a close race then and obviously remained so on Election Night. Cochran’s less than hard-charging style — he said the first thing he’d do after an election victory would be to “take a nap” — also couldn’t have been helpful. However, Cochran isn’t necessarily toast: Recall that former Sen. Blanche Lincoln (D-AR) turned in a weak performance in her 2010 primary but then won a runoff (she went on to get clobbered in the fall campaign, a fate that would not befall Cochran). Mississippi Republicans told us before the election that their voters would favor Cochran in part because they recognized the importance of the federal money that the six-term incumbent had long delivered. That assessment missed the desire for conservative ideology amongst the GOP electorate today, particularly in a place like Mississippi (where Mitt Romney actually finished third in the 2012 GOP primary). Former Rep. Travis Childers, the Democratic nominee in Mississippi, decided to run because of the possibility of a McDaniel win. His gamble looks likelier and likelier to pay off, and this could actually be a race in the fall, particularly if McDaniel stumbles and the runoff is bloody. One other point: McDaniel has faced questions about some past impolitic comments from his days as a radio host and also about his attendance at pro-Confederate events. If McDaniel is the nominee, Democrats will try their best to make him the most famous Republican Senate candidate in the country, and the national press will jump at the opportunity to highlight a hard-right Tea Partier from Mississippi. It’s extremely challenging for a Democrat to win a statewide race in Mississippi because of the state’s very racially polarized voting (whites outnumber blacks, and the whites are nearly as Republican as the blacks are Democratic), but the race gets more competitive with McDaniel as the nominee, provided that’s what happens. We’re moving the contest from Safe Republican to Likely Republican for the general election, with a Leans McDaniel designation in the primary. Also of note in Mississippi: Party-switching ex-Rep. Gene Taylor (R) ran an impressive race against Rep. Steve Palazzo (R, MS-4), but it appears that the incumbent will narrowly avoid a runoff. The other big race on Tuesday night turned into a laugher. State Sen. Joni Ernst (R), she of the now-famous hog castration ad, blew past her GOP Senate primary competition, winning a majority of the vote against four other candidates. Her victory sets up what should be a fierce general election contest in a race where we have a tentative Leans Democratic rating. 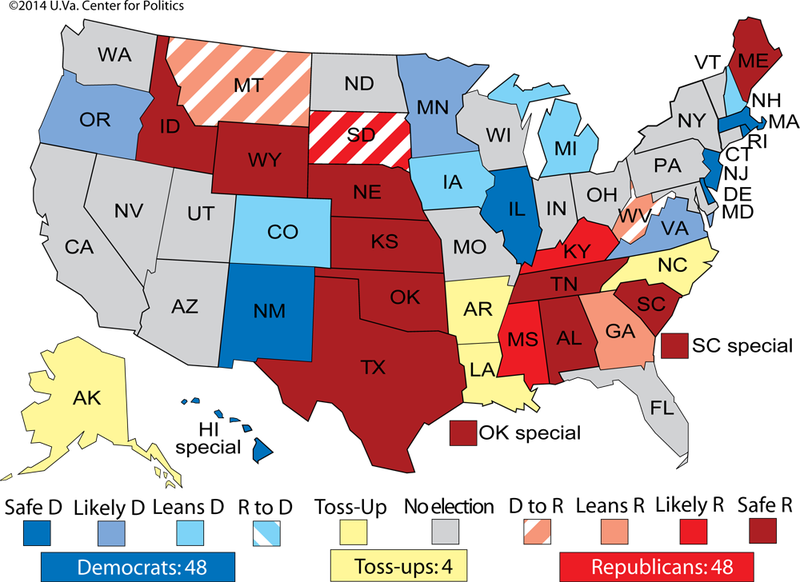 It would be tempting to move Iowa’s Senate race to the Toss-up column, but we’re not quite there yet. The HuffPost Pollster average puts Braley up about five points, 44% to 39%, over Ernst. Let’s see if polls tighten. Also, let’s not forget that despite a strong primary campaign, Ernst ranked fairly low on national Republican wish lists when Sen. Tom Harkin (D-IA) retired. Ernst proved herself to be the best of a second-tier lot: Now she’s in a first-tier race, and she needs to continue to improve her performance, particularly on fundraising (although surely third-party groups can help her pick up the slack). That said, Braley isn’t the world’s strongest nominee, and he slipped up earlier in the cycle by seeming to insult Sen. Chuck Grassley (R-IA) and farmers in a speech to lawyers. Ernst could be the first woman ever elected to Congress from the Hawkeye State, which stands along with Mississippi as the only states never to do so. Iowa might end up sending more than one woman to Congress this year: In addition to Ernst, former state Sen. Staci Appel (D, IA-3) is in a Toss-up open House race (she’s waiting for the Republicans to pick a candidate at a convention because no one got more than 35% in the Tuesday primary). Another female possibility in Iowa is Mariannette Miller-Meeks (R), the IA-2 nominee who came close to beating Rep. Dave Loebsack (D) in 2010. This race comes on the board as Likely Democratic. Rep. Steve King (R, IA-4), being challenged by veteran Jim Mowrer (D), also merits listing here as Likely Republican. Despite Ernst’s history-making potential, it’s a very safe bet that Braley, the man, will do better with women than Ernst, the woman, and vice versa. Gender gaps are present in nearly every recent federal statewide election, and there’s no reason to think this will be an exception. In Iowa’s 2012 presidential race, Romney (a prominent Ernst endorser) won men by nine, and President Obama won women by 19. The campaigns and the candidates will matter a great deal in the Senate contest, as will Obama’s standing: His approval polling in Iowa has generally been below his national average. Braley’s progressivism would provide a rather natural continuity with the retiring Harkin, a solid liberal, but in a midterm with a Democrat in the White House, Braley is going to have to earn it. We rate three other Democratic-held seats as Leans Democratic — Colorado, Michigan and New Hampshire — but we think this is the closest one to being called a Toss-up. As a refresher, our full Crystal Ball Senate ratings are below, in Map 1. In California, national Republicans got their preferred candidate, former Treasury Department official Neel Kashkari, through the state’s top-two gubernatorial primary. Kashkari has hardly any chance against Gov. Jerry Brown (D), but he should do better than the other GOP possibility, more conservative Assemblyman Tim Donnelly (R). The rest of the action in California had to do with the House. Democrats hold a 38-15 advantage in California’s House delegation, and they netted four seats there in 2012 after nonpartisan redistricting produced a favorable map following the 2010 census. But there are several competitive Democratic-held seats that Republicans are targeting, and Democrats have their eyes on a couple of seats as well. It appears that Democrats avoided disaster in CA-31, an open seat that Rep. Gary Miller (R, CA-31) won in a fluke in 2012 — two Republicans, including Miller, advanced to the general election because of a split Democratic field. That almost happened again this time, but it appears that Redlands Mayor Pete Aguilar (D), the Democratic Congressional Campaign Committee’s preferred candidate, will advance to face Paul Chabot (R), a reserve Navy officer. The race has not been called yet, but assuming Aguilar stays ahead of Lesli Gooch (R) — he’s up 17.4% to 16.5% at the moment with some ballots outstanding — this race retains its Leans Democratic rating. Obama got 57% here in 2012. Two Republicans did, however, advance to the general election in a lower-tier Democratic opportunity: CA-25, the seat of retiring Rep. Buck McKeon (R). Former state Sen. Tony Strickland (R) and state Sen. Steve Knight (R) finished a close first and second in this district, which Mitt Romney won 51%-48% in 2012. It goes from just Leans Republican to Safe Republican. In CA-26, it appears that Rep. Julia Brownley (D) will have a tough contest against state Assemblyman Jeff Gorell (R). Brownley got 46% to Gorell’s 44% as they both advance to November. This race goes from Likely Democratic to Leans Democratic. Also of note for November: National Republicans got their preferred candidate to challenge Rep. Ami Bera (D, CA-7) in former Rep. Doug Ose (R), and national Democrats got their favorite to challenge Rep. David Valadao (R, CA-21) in Amanda Renteria (D), a former chief of staff to Sen. Debbie Stabenow (D-MI). Both races continue to lean toward the incumbents. And, as expected, Rep. Scott Peters (D, CA-52) will face former San Diego mayoral candidate Carl DeMaio (R) in a much-watched Toss-up race. For the sake of brevity, we’re not going to go into detail on seats we have rated as safe for one party or the other except to note that the nationally watched Silicon Valley primary between Rep. Mike Honda (D, CA-17) and former Obama administration official Ro Khanna (D) will continue on to November. In a sense, the top-two primary system in California provides something of a dry run for November because all candidates compete against one another. That said, as National Journal Hotline editor Scott Bland noted before Tuesday’s primary, it’s important not to project the results of a low-turnout June primary to a higher-turnout November midterm in California. Alabama: On the federal level, the only noteworthy contest in the Yellowhammer State was in the AL-6 GOP primary. Rep. Spencer Bachus (R) is retiring after 11 terms in the House, and his very conservative district (74% Romney) attracted many Republican office-seekers — seven — like bees to honey. Predictably, the large field resulted in a GOP runoff between state Rep. Paul DeMarco, who led the field with 33%, and think tank co-founder Gary Palmer, who finished second with 20% (a candidate endorsed by the Club for Growth missed the runoff). In the state’s gubernatorial primary, Democrat-turned-Republican-turned-Democrat ex-Rep. Parker Griffith sewed up his old (new) party’s nomination. He’ll be a heavy underdog against Gov. Robert Bentley (R) in the fall. Montana: In the Big Sky Democratic Senate primary, appointed Sen. John Walsh (D) faced off against former Lt. Gov. John Bohlinger and rancher Dirk Adams. Walsh won the primary with 64%, but he still faces an uphill battle in November against Rep. Steve Daines (R). With Daines running for the Senate, Montana’s at-large House seat is open: On the Democratic side, John Lewis, a former aide to ex-Sen. Max Baucus (D), clinched his party’s nomination, while Republicans selected former state Sen. Ryan Zinke for the fall campaign; the Crystal Ball rates the race Likely Republican. New Jersey: The most watched Garden State race of the night was in NJ-3, a potentially competitive district in the fall. With Rep. Jon Runyan (R) retiring after two terms, Republicans picked former Randolph Township Mayor Tom MacArthur over 2013 Senate nominee Steve Lonegan, 60%-40%, nominating the candidate widely seen as the stronger general election choice. MacArthur will now face Burlington County Freeholder Aimee Belgard (D), who easily won her party’s primary. With MacArthur’s nomination victory, we’re moving this race from Toss-up to Leans Republican as Tuesday’s result makes it more likely that the GOP will be able to retain the seat. However, Democrats love Belgard and plan to compete hard for the swing seat. Meanwhile, in two safe Democratic seats, the dominant party chose their fall standard bearers. In NJ-1, state Sen. Donald Norcross easily won the Democratic primaries for both the regular and special elections to fill the seat vacated by ex-Rep. Rob Andrews (D). In NJ-12, state Assemblywoman Bonnie Watson Coleman won the Democratic nomination to replace retiring Rep. Rush Holt (D). In the state’s GOP primary for Senate, Jeff Bell won with around 30% of the vote in a four-way race. A former speechwriter for Ronald Reagan, Bell stunningly defeated incumbent Sen. Clifford Case (R) in the 1978 Republican primary, but lost to Bill Bradley (D) in the general that year. Bell’s fate will likely be similar in 2014 — he faces Sen. Cory Booker (D), the popular former Newark mayor who won a special election for the seat in 2013. New Mexico: Democrats determined their choice to take on incumbent Gov. Susana Martinez (R), picking state Attorney General Gary King from a crowded field. King is the son of ex-Gov. Bruce King (D), but despite his political bloodlines, King is an underdog in the general. Martinez is hoping to cement her status as a significant name in the 2016 GOP field, if not for president then definitely for vice president. In the Land of Enchantment Senate race, former state GOP chair Allen Weh (R) claimed the GOP nomination, but we’re keeping a Safe Democratic rating for incumbent Sen. Tom Udall (D). South Dakota: The Mount Rushmore State is one of only two non-southern states with a runoff rule. However, a candidate only has to win 35% to avoid what South Dakotans term a “secondary” election, and former Gov. Mike Rounds (R) easily accomplished that task, garnering 55% in the state’s GOP Senate primary. He will be a heavy general election favorite against the Democratic nominee, former 1996 cycle House candidate Rick Weiland. While there are five primaries next Tuesday (June 10), the slate — in Maine, Nevada, North Dakota, South Carolina and Virginia — lacks the kind of high-profile contests we saw this past Tuesday. The main attraction, if there is one in these contests, is the Republican Senate primary in South Carolina. On paper, Sen. Lindsey Graham (R-SC) seemed to go into this election cycle as perhaps the most endangered Republican Senate incumbent in the country because of his willingness to compromise on certain issues with Democrats, such as immigration and judicial nominations. Graham probably would have been in deep trouble if one of the state’s Tea Party-aligned U.S. House members, like Reps. Trey Gowdy (SC-4) or Mick Mulvaney (SC-5), would have challenged him. But the top-tier challengers took a pass, leaving a motley field of little-known contenders to face Graham, a fundraising juggernaut. The outside conservative groups that supported McDaniel in his high-profile battle with Cochran in Mississippi have largely stayed out of this contest as none of the challengers has caught fire. Graham could very well win the 50% he needs to avoid a runoff, but at the same time, polling is scarce. The problem for any of the challengers is that the runoff will be only two weeks after the June 10 primary, on June 24. Consolidating the anti-Graham vote in such a short period of time would be difficult, particularly if the conservative insurgent-backers like the Club for Growth stay on the sidelines. Ultimately, Graham could easily have found himself in far more trouble than he is; still, he can’t afford to relax until he gets over the magic 50% mark. Maine: Democrats and Republicans will pick candidates in the state’s open ME-2 U.S. House district. The contenders on the Democratic side are state Sens. Emily Cain and Troy Jackson; the Republicans will pick between Bruce Poliquin, a former state treasurer, and Kevin Raye, whom Rep. Mike Michaud (D, ME-2) defeated in both 2002 and 2012. Michaud is vacating the seat to run for governor, which is a three-way race that also includes incumbent Gov. Paul LePage (R) and independent Eliot Cutler, who began his career in politics as a legislative aide to former Sen. Ed Muskie (D-ME). Cutler finished a very close second to LePage in 2010 but appears stuck in third place this time. Nevada: Other than Republicans determining who will face Rep. Steven Horsford (D, NV-4) in a race that is rated Likely Democratic, nothing else really stands out here in the races the Crystal Ball follows (governors and congressional seats). North Dakota: Zzzzzzz. The Peace Garden State has no desire to fight these days, as it revels in its new standing as the best state in recovering from the Great Recession. Virginia: The Old Dominion uses a hybrid nomination system where individual races are sometimes determined by conventions, “firehouse” primaries or conventional primaries. For instance, the Republican Senate nomination is being decided by a convention this Saturday (former Republican National Committee Chairman Ed Gillespie shouldn’t have any trouble winning). Still, there are two House primaries worth watching. In VA-8, an open Northern Virginia seat, the Democratic primary will be tantamount to election. With a big field and no runoff, the winner probably won’t even need to clear 30% to win the nomination outright. Former Virginia Lt. Gov. Don Beyer is the favorite, with several other credible candidates lurking. This might be the cushiest seat in the entire House: Not only will it be safe in general elections for its new Democratic occupant, but it’s just on the other side of the Potomac from the Capitol. The new member has an easy commute and can sleep at home every night. Meanwhile, House Majority Leader Eric Cantor (R, VA-7) is facing a spirited challenge from college professor Dave Brat in the GOP primary. The race has attracted coverage in part because Cantor has given it attention by taking it seriously, but who can really blame him for that? Cantor’s position in the House leadership means that he sometimes has to do things that more ideological conservatives don’t like. That helps explain why Speaker John Boehner (R, OH-8) couldn’t crack 70% in his own renomination bid last month. There’s no indication that Cantor will lose, but don’t be surprised if he runs below the speaker. Washington Kremlinologists trying to determine the identity of Boehner’s eventual replacement as speaker will be watching. The primary season takes a break on June 17 but returns June 24 with five contests in Colorado, Maryland, New York, Oklahoma and Utah, as well as the Mississippi Senate runoff. As mentioned, if the GOP South Carolina Senate primary goes to a runoff, it will also be held this day. We’ll have more on all these contests in future issues of the Crystal Ball. There are no regular primaries in July, with the rest of the states voting in August and early September.